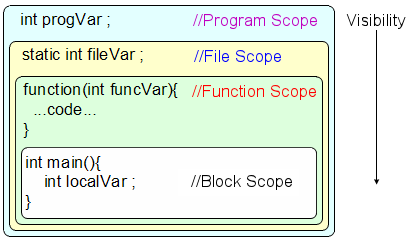 The concept of Scope refers to where an object is valid, i.e. where it can be uniquely used. Sometimes referred to as its spatial region. An object is not valid until it has been declared. An object becomes valid from the point at where it is declared. Illustration of visibility of scope, whereby outer layers can be seen by inner layers, but inner layers can not be seen by outer layers. Notice that there is only one named variable called theVar. However we can uniquely act upon its multiple specific vales, depending on how and where it is declared and used.